Tom Hooper Wins Best Director for "King's Speech"
Hilary Swank, the most unlikely two-time Oscar winner this side of Shelley Winters, came out to present the Best Director Award. Swank was joined on stage by 2010 Best Director winner Kathryn Bigelow ("The Hurt Locker"), the first and only woman to win the coveted prize. Tom Hooper took the award, cementing "The King's Speech" the odds-on favorite for Best Picture. "Wow--thank you to all the members of the Academy. This is an extraordinary honor. I'd like to thank my fellow nominees…Thank you to my wonderful actors, the triangle of man-love, which is Colin Firth, Geoffrey Rush and me…Helena, I hope that doesn't make you jealous…most of all, thank you to my parents." Hooper went on to relate how it was his mother who discovered "The King's Speech" when it was a play in Australia and called him up to say she had found his next film. 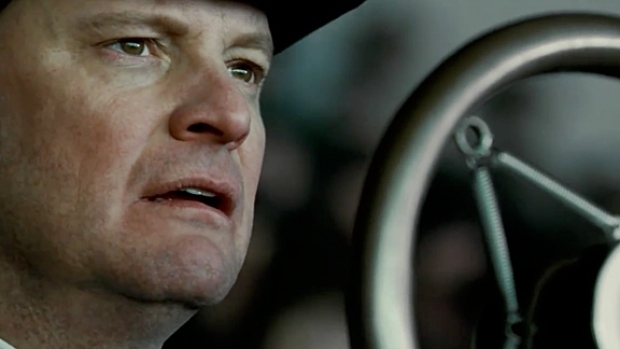 Colin Firth stars as Prince Albert, a man with a crippling speech impediment who suddenly finds himself the king of a nation on the brink of war. Co-stars Geoffrey Rush and Helena Bonham-Carter. "The moral of the story is listen to your mother." Annette Bening, Best Actress nominee for "The Kids Are All Right," came out to introduce the Governors Awards package, which were distributed on Nov. 14: actor Eli Wallach, film historian/preservationist Kevin Brownlow, and director/producer/screenwriter and Irving G. Thalberg Memorial Award recipient Francis Ford Coppola. The 4th honoree, legendary crank Jean-Luc Godard declined to take part in any of the kerfuffle.